Brassy dance beats for all occasions. 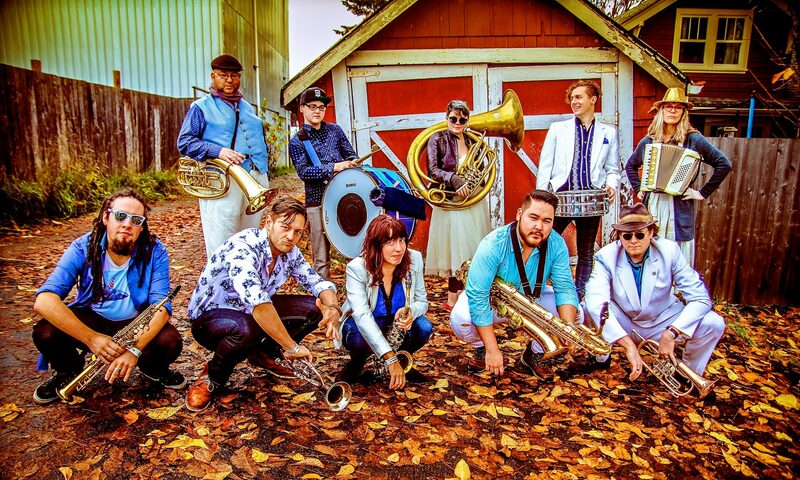 Balkan Shmalkan is East Vancouver’s sweet dance party orchestra; think global music with local attitude. Their funky brass dance beats are rooted in the aural traditions of the Roma and Klezmorim of Eastern Europe and blended with a mixture of pop and jazz. Members of the group sing in 5 languages including Serbian, Romani, and Italian. The group contains six to twelve musicians playing reed, brass and percussion instruments of both eastern and western origin. Balkan Shmalkan is the brain child of a group of musicians with a long history of collaboration in traditional South Serbian Trubaci music. This project is a way of blending that music with other vibrant traditions and bringing it to the general population of Greater Vancouver. Balkan Shmalkan is exceptionally versatile and mobile, playing on and off stage with nothing more than the power of their lungs and a few horns. We have a new website! we’ll tell you about stuff here!